Learn how to make a polymer clay ring dish with our easy video tutorial. 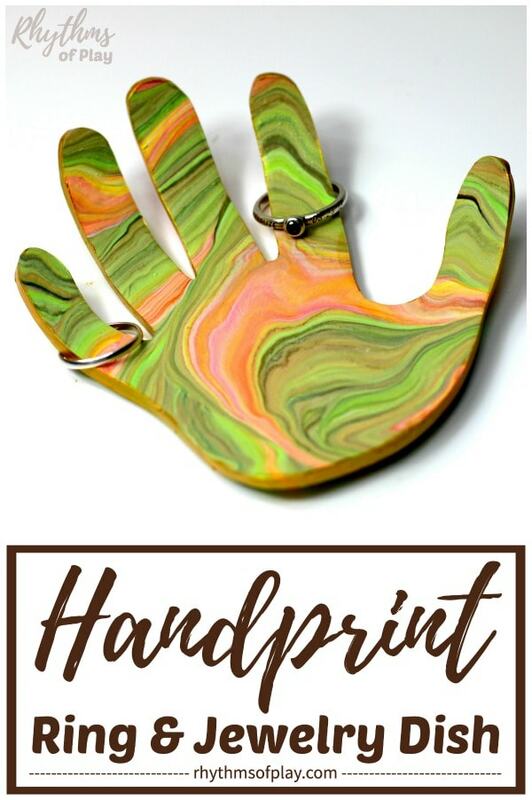 A handprint art marbled clay jewelry dish is a unique homemade gift idea that kids can make for Mother’s Day, Father’s Day, Christmas or a birthday. 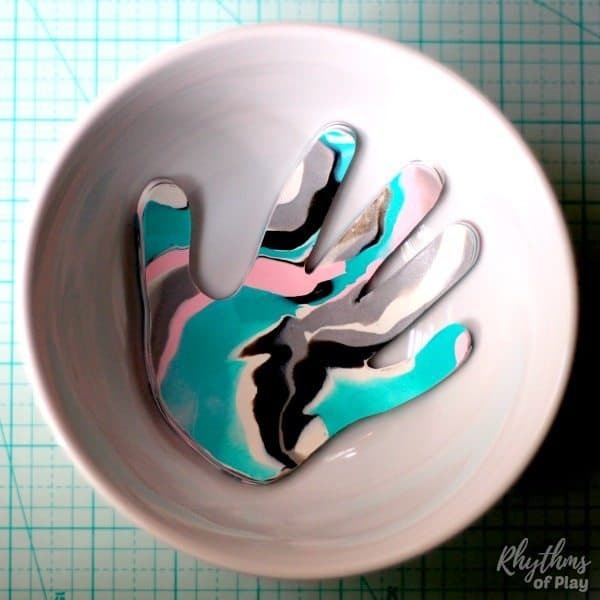 Use this DIY marbled clay ring dish tutorial to make a handprint jewelry bowl with your children, or, make your own ring dish! These clay handprint art jewelry dishes and ring bowls were inspired by THESE clay ring dishes by A beautiful mess. 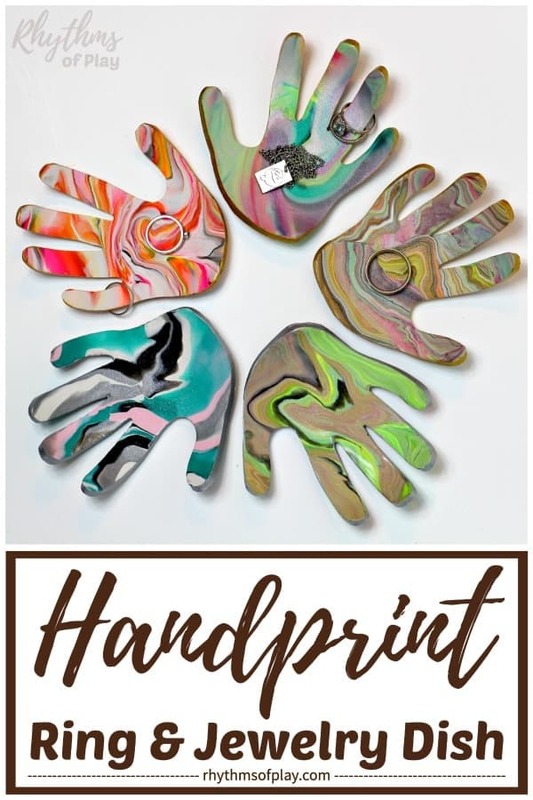 Instead of making the clay ring bowls round, I wanted to make them into the shape of my daughter’s handprint to give away as Mother’s Day and Father’s Day gifts… Her grandparents loved them! The necklace in the top handprint jewelry bowl in the photo below is a drawing of my daughters that I had made into a necklace. For more information about kid’s art jewelry click HERE! Another fun idea is to have your child make a beaded “mom or mum” necklace or a thumbprint heart necklace to complete the gift. Trace your child’s hand. It is a lot easier, and safer, to trace a handprint art template to cut the ring holder dish with an Exacto-knife, than your child’s real hand. 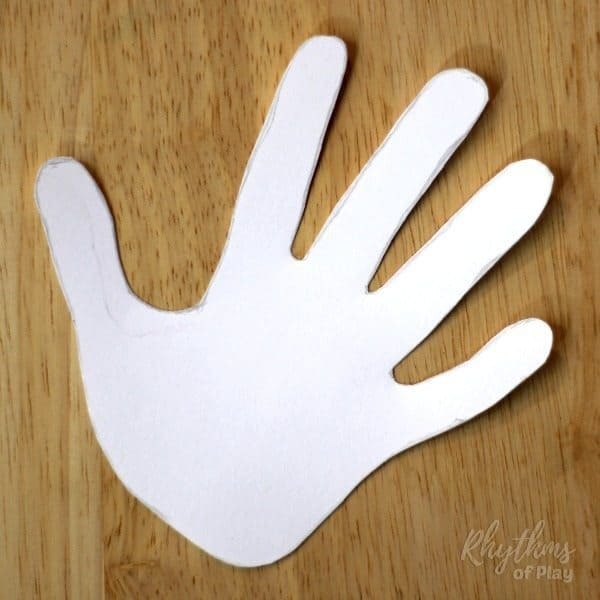 We made our handprint art template with cardstock to have a sturdy handprint template to use over and over again. It’s almost impossible to trace a young child’s hand perfectly. Clean up the lines until you like the shape, and then cut it out. 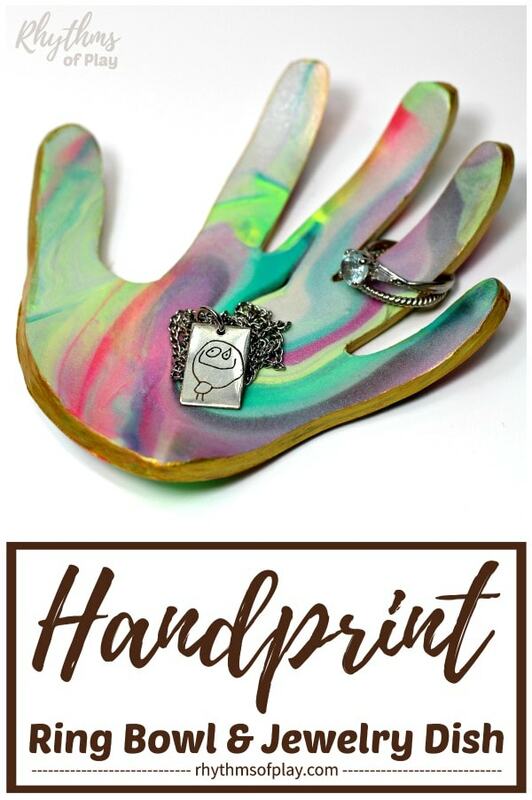 The good news is that you only need to trace one hand to make a handprint art template for your ring dish. You can flip it to either side to make a left or right-handed jewelry bowl. The ring bowls by “A Beautiful Mess” were the inspiration for our handprint art ring holder dish and jewelry bowl. We started out using their marbled polymer clay ring dish directions and then played with mixing the clays in different ways to get different effects. 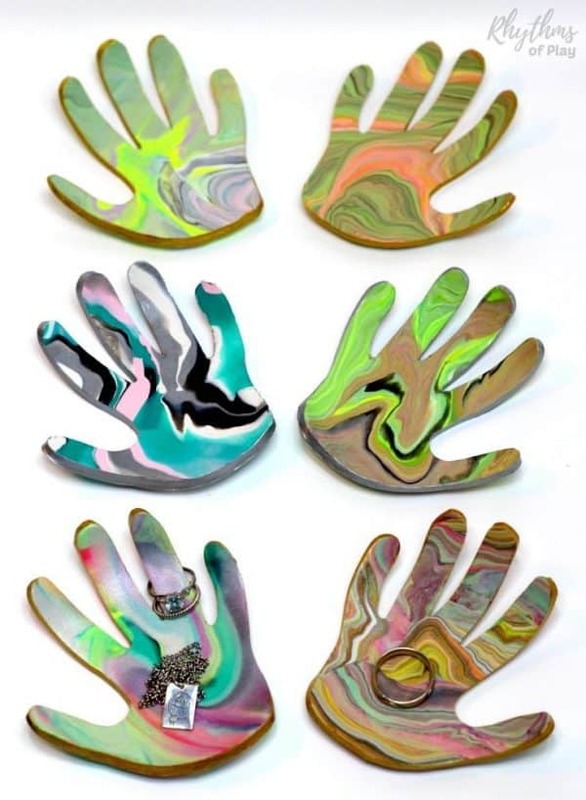 After making several marbled polymer clay ring dishes, we have come up with a few additional tips to share below. Select a few polymer clay colors and roll them into several sizes of snakes (thin vs thick) to vary the marbled effect. A tiny bit of black polymer clay added into the mix is important. The black polymer clay helps define the marbling and makes a jewelry bowl look gorgeous with or without gray polymer clay added to it. In other words, a marbled polymer clay jewelry bowl just doesn’t look as good without the black clay. To get a super marbled swirly look, roll your marbled ball of polymer clay into a snake again. Next, fold the clay snake in half and twist it up super tight–AGAIN! Reuse the polymer clay from two or more ring bowl scraps to make another ring dish. Roll the scraps from each clay jewelry dish into one or more snakes and then twist them together. You can even add in another snake of polymer clay in a different color if you like. Make each DIY clay jewelry bowl as thick as you can. Jewelry dishes and ring bowls that are made too thin are extremely fragile. 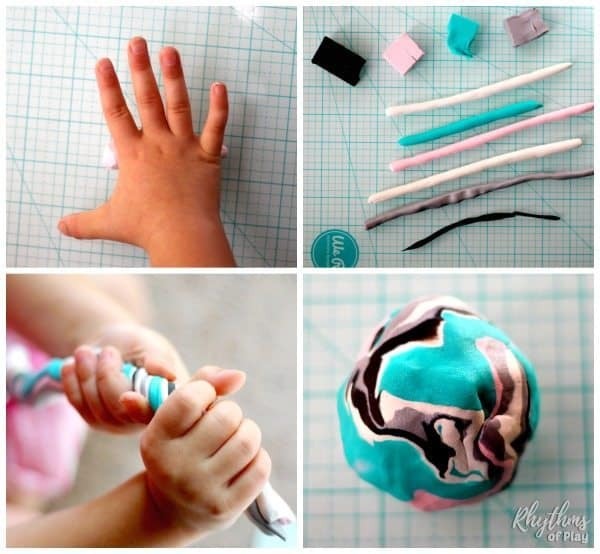 Roll your twisted marbled clay into a ball and use a rolling pin to flatten. We used a precision glass cutting mat for rolling out and cutting our marbled clay hand-shaped ring dish. It makes it easy to protect our tables and counters from stains and cuts. It also makes a great painting pallet. Even dried paint can be scraped off easily! 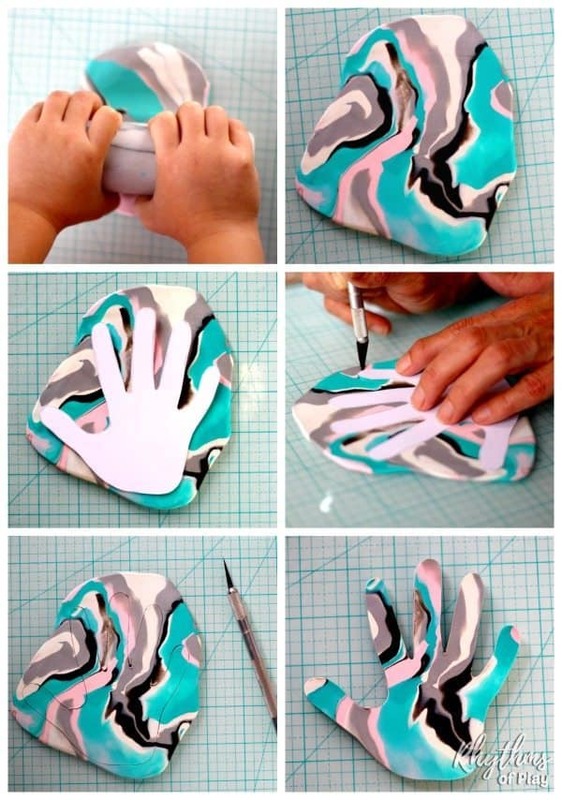 Place the marbled polymer clay handprint art into an oven safe bowl and bake according to the polymer clay manufacturer’s directions. We cooked our jewelry dish for 15-20 minutes @275 degrees. 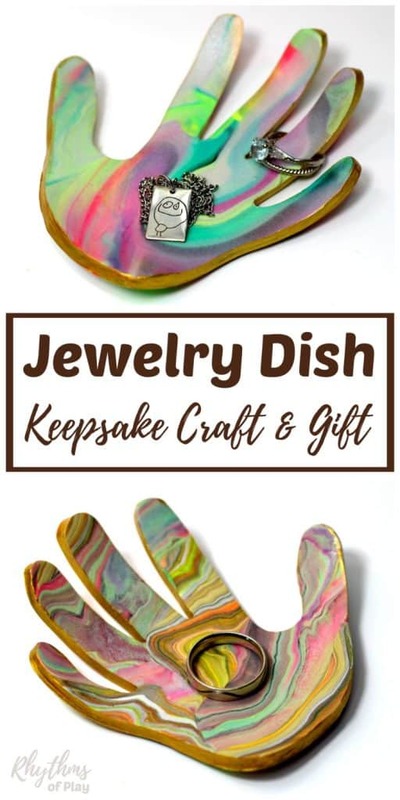 Allow all of the handprint art jewelry dishes to cool completely before moving on to the next step. Use a small brush to paint acrylic metallic paint around the rim of each handprint art jewelry dish or ring bowl and allow to dry. Have a wet rag close by to keep the marble clay ring dish clean as you work. Make a beautiful ring holder dish with your children at home or in the classroom. A jewelry dish makes a wonderful homemade gift idea for Mother’s Day or Father’s Day. 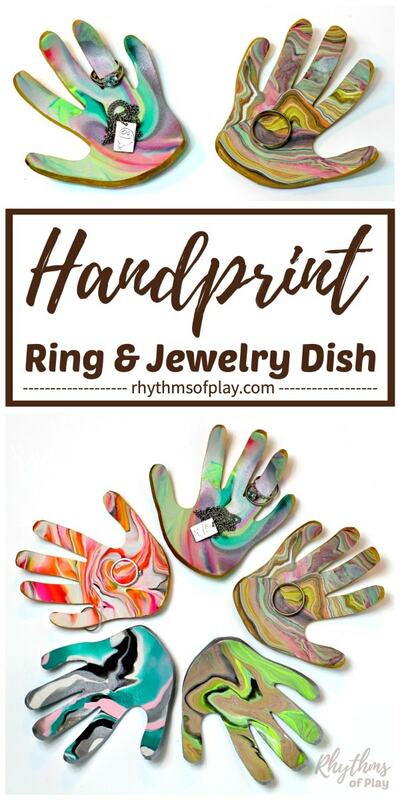 Kids can make a handprint art jewelry dish, or DIY ring bowl, for parents and grandparents with a little help from a caregiver, or teacher, either at home or in the classroom. 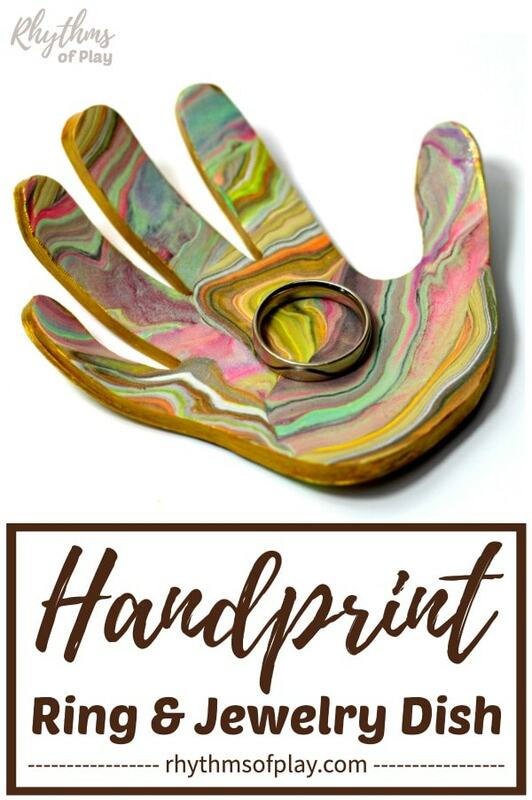 A marbled clay ring holder dish makes a unique gift idea that friends and family will love! Complete the gift with any of the easy ideas below! The necklace in the handprint jewelry dish in the left handprint ring bowl pictured below is a drawing of my daughters that I had made into a necklace. For more information about kid’s art jewelry click HERE! 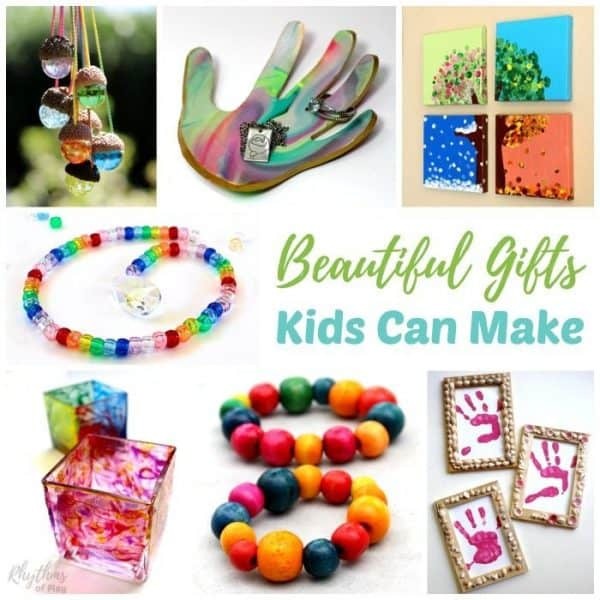 Even more gorgeous gift ideas can be found in this awesome collection of homemade gift ideas kids can make! How much clay does it take for each hand? Good question Carla. You’ll need a small handful for each hand. Do you best to keep the hand at least 1/4 inch thick. If it is too thin it will easily break. I hope that helps! I absolutely love this idea for a mother’s day project for the kiddos. I have watched multiple YouTube “how to” videos and I don’t see why the adhesive is necessary in this project. I bought the three pack glaze as suggested but I’m left thinking of how to incorporate the adhesive. Is it in case we add bling? Yes, Adriana, the only use for it is to add bling. You don’t really need it for this project. We found it useful for making snowman ornaments to make sure the twig arms stuck and the carrot nose stayed put.